Get essential vitamins and nutrition with Now's Ultra Omega 3. 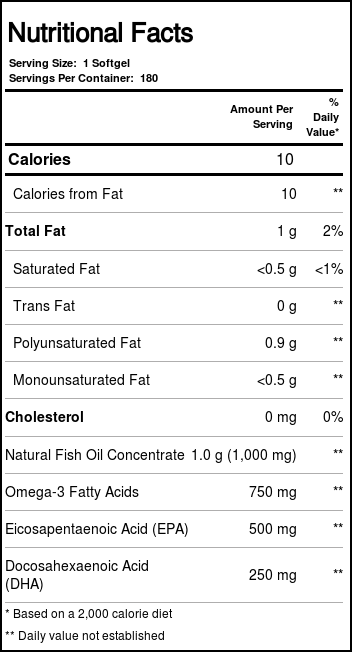 Omega 3 fatty acids traditionally are derived from fish oil concentrate. 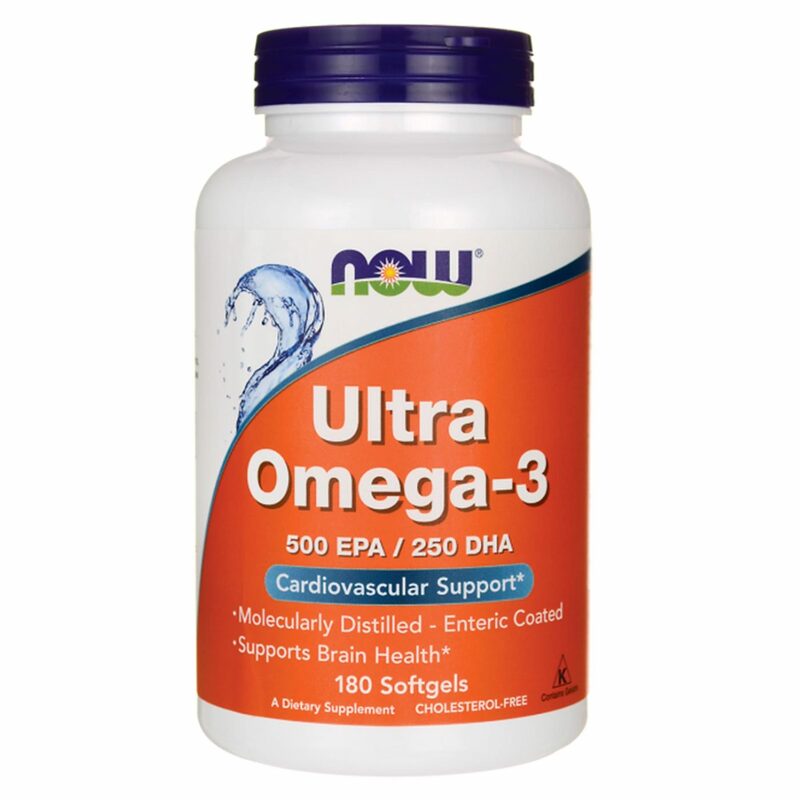 Now's Ultra Omega 3 contains extra strength doses of EPA and DHA, two essential fatty acids. Ultra Omega 3 is a much needed dietary supplement. Order yours today. Warnings: For adults only. Consult physician if pregnant/nursing, taking medication, or have a medical condition. Keep out of reach of children. Store in a cool, dry place. Recommended Use: As a dietary supplement, take 1 softgel 1 to 2 times daily with food. The customer reviews posted below are based on individual consumer experiences and may NOT necessarily represent what expected results will be from using or taking Now Foods Ultra Omega 3 - 750 mg - 180 Softgels. These results may not be typical and you should not necessarily expect to receive the same results. Actual results may vary. After a detailed research I decided to buy a Omega 3. Problem is that not every form is effective. However on eVitamins you always find what you are looking for and don’t have to worry about quality. This Omega 3 is very good especially for women. I am a regular customer here and can recommend it to everyone. Delivery to UK usually taking 2-3 weeks. Products always have a good package and never damages through the delivery. I am ordering all my vitamins and supplements for myself and my family Only from eVitamins. Best cost-benefit in Omega. I do not buy more in Brazil, I only buy here online for more than 2 years. Can buy without a doubt. Use by health and medical indication, I perceive the health and well-being. I make daily use and recommend it. Great quality, the best Omega-3 I've ever had, I did not taste fish in capsules or after eating it. And the dosage of the package is excellent, so I do not have to worry about taking 2 capsules at a time. This product is wonderful, the best Omega-3 I've ever had, combining the properties of EPA with DHA. My doctor recommended this brand for being one of the best if not the best in the market. The coating of the product is enteric softgel, which assists in absorption into the stomach. The enteric coating avoids the unwanted belching back that can happen with some fish oils, which leave that horrible taste in the mouth. One more positive point of this product. This coating is made to withstand the stomach acids and enzymes, causing the capsules to disintegrate only in the small intestine and minimizing or canceling belching. I've never had a bad taste in my mouth. The fish oil used in the formula is ultra-concentrated, preventing heart disease, reducing inflammatory processes in the body and joint pain. The DHA and EPA values per capsule are high, so just ingestion of 1 or 2 capsules per day to get the 1000 mg, ideal amount and recommended by most medical specialists. With another product, from another brand you would have to take more capsules and the result would not be good, because the taste of oil in the mouth causes the organism to have nausea and even vomiting, which does not occur with this product. I love all products of the Now Foods line, I'm a super fan. The best brand of supplements on the market, you can buy without worries. The Evitamins delivery service is excellent, super agile, I only have compliments to weave. Excellent source of Omega-3. It has an excellent concentration of 500 EPA and 250 DHA per capsule. They are 180 large gelatinous capsules, but easy to swallow. They have no smell and their amber coloration is pleasant. I take a capsule every day for my breakfast. Omega-3 is an excellent neuroprotective and possesses formidable brain benefits. It is also great for helping and protecting the entire cardiovascular system. I always try to get Omega-3 from great sources because my whole family makes use of this supplement. This Now Omega-3 is one of the best and one of my favorites precisely because it is high quality and reliable. It is made of high quality raw material. The 180-capsule pot lasts for several months and the price is very fair. I'll buy again as soon as my pot is running out. Five stars!